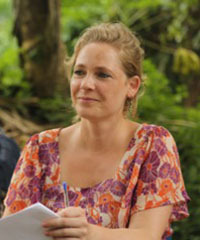 Professor Nadine Grimm joined the Department of Linguistics in October 2014. MA in African Studies, German Linguistics, and French. April 2006 - February 2010. Humboldt University Berlin, Germany, Department of Asian and African Studies. Thesis: The Numeral System of Ikaan. BA in General Linguistics and French. October 2002 - March 2006. University of Bielefeld, Germany. NSF BCS-1535846: Causality Across Language. August 2015 - current. Role: Collaborator, PI: Prof. Jürgen Bohnemeyer, SUNY Buffalo. Volkswagen Foundation "DoBeS" (Documentation of Endangered Languages) Project on Bakola/Bagyeli (Cameroon). Research Grant. April 2010 - August 2014. Hans Rausing Foundation: Endangered Languages Project on Ikaan (Nigeria). Fieldwork Grant. January - March 2008. Fellow of the German National Academic Foundation (Studienstiftung des Deutschen Volkes). February 2007 - December 2009. Grimm, Nadine. A Grammar of Gyeli. In preparation. Dissertation defense version from 2015. Grimm, Nadine. Implosives in Bantu A80? The case of Gyeli. In press. Proceedings of the 47th Annual Conference of African Linguistics. Borchardt, Nadine. (2012) Agreement in Ikaan compound numerals. In: Brenzinger, Matthias & Anne-Maria Fehn (Ed.). Proceedings of the 6th WOCAL World Congress of African Linguistics. Köln: Rüdiger Köppe. Borchardt, Nadine. (2011) The numeral system of Ikaan, a Benue-Congo language of Nigeria. Asien- und Afrikastudien der Humboldt-Unversität zu Berlin. Wiesbaden: Harrassowitz.